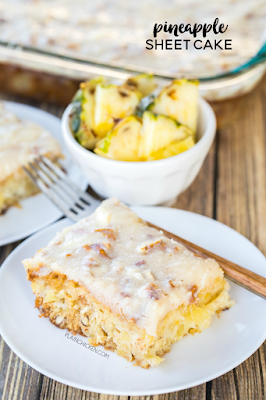 Pineapple Sheet Cake - seriously delicious! 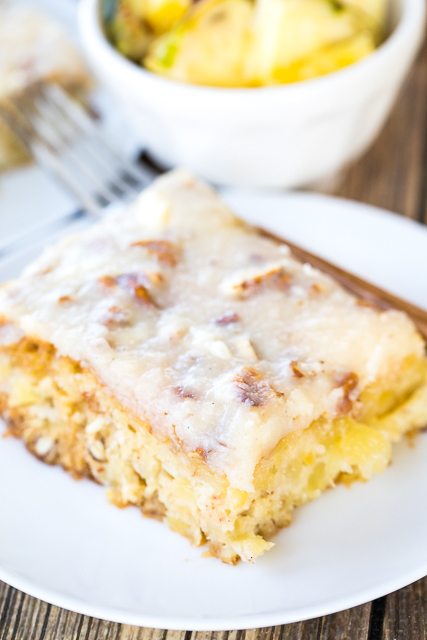 Easy pineapple cake with a delicious cream cheese frosting! Sugar, flour, baking soda, vanilla, crushed pineapple, pecans, butter, cream cheese. Great for cookouts and potlucks. Can make ahead of time and refrigerate until ready to serve. I was thumbing through one of my old cookbooks and this Pineapple Sheet Cake recipe caught my eye. I read through the ingredients and noticed that there weren't any eggs in the cake. I thought that sounded very interesting and decided to give it a try for dessert. OMG! It was SO good! I was skeptical since there weren't any eggs in the cake, but it was really delicious! The cream cheese frosting really puts this easy cake recipe over the top! 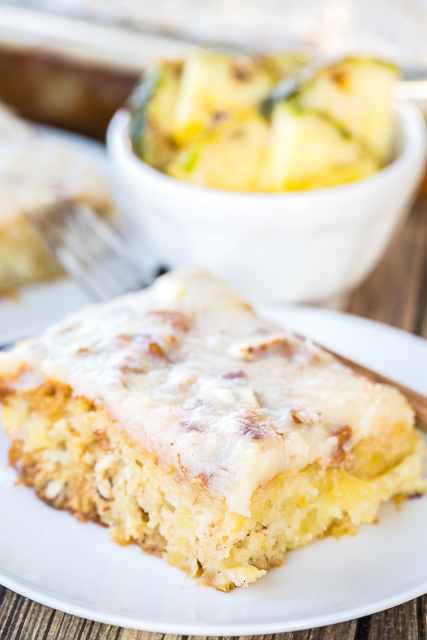 This cake can be made ahead of time and refrigerated until you are ready to serve. It is great for a summer cookout and potluck. We think the cake is best served at room temperature. I just take it out a couple of hours before serving. This cake is always a hit! I've taken it to several potlucks and everyone always asks for the recipe! Preheat oven to 350ºF. Lightly spray a 9x13-inch pan with cooking spray. Set aside. In a large bowl, combine 2 cups sugar, flour, baking soda, vanilla extract, crushed pineapple and 1/2 cup chopped pecans. Pour batter into prepared pan. Bake for 35 to 45 minutes. While cake is baking prepare frosting. Combine melted butter, softened cream cheese, 3/4 cup sugar and 1/2 cups chopped pecans. Remove cake from oven and immediately spread frosting over warm cake. Cool and refrigerate until ready to serve. Bring cake to room temperature before serving. I'm assuming granulated sugar for the cake, and powdered sugar for the frosting. Is that correct? Nope. Just regular sugar in both. Enjoy!